Calculations at a gear, or cogwheel, with isosceles trapezoids as cogs. Those are set regularly on a circle, so that the cog edge exactly fits in the gap between the cogs. 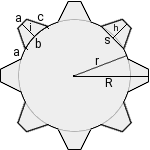 This is a simplified representation of a gear, it is not checked whether the gear works or not. For a gear with pointed cogs, see polygram. The required input is: for the number of cogs a natural number of at least 3. Two values of circle radius, cog height and gear radius. The ratio between cog edge (or gap) and cog base. For this, v ∈ ] 0 ; 1 [ must apply. The other values will be calculated. the cog is too flat. Radiuses, heights, lengths and perimeter have the same unit (e.g. meter), the area has this unit squared (e.g. square meter).